A mixture of Italian artistry with western grime, Boot Hill sparkles in patches with clever editing and brash juxtapositions. A muddled story and rather limp climax take some of the shine off. The mysterious Cat Stevens (Terence Hill) is pursued by a large posse intent on killing him for reasons never made clear. 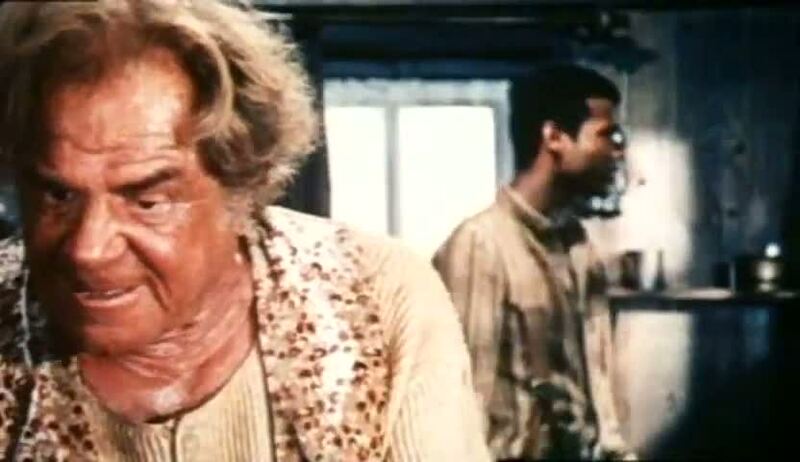 Wounded in a gunfight, he escapes and takes refuge with a travelling circus run by Mamy (Lionel Stander) and featuring trapeze acrobat Thomas (Woody Strode). When Thomas' son is killed by Cat's pursuers, Thomas and Cat team up and join forces with Hutch Bessy (Bud Spencer), Cat's partner from adventures past. The three men come to the aid of a community of miners being bullied by a corrupt tycoon and his brutal henchmen. The third instalment in the loose trilogy that started with God Forgives...I Don't! (1967) and continued with Ace High (1968), Boot Hill was later re-released and falsely marketed as part of the more famous (and less gritty) Trinity series. In Boot Hill, Terence Hill and Bud Spencer still have an edge, with violence and ruthlessness to the fore and any attempts at comedy kept well in control. The result is more serious and closer to the original Spaghetti Western ethic. Director Guiseppe Colizzi injects Boot Hill with sometimes stunning visual flair. Making the most out of the organized chaos that surrounds Mamy's travelling circus, complete with dwarfs, heavily made-up faces and dancing girls, Colizzi creates Boot Hill's best scenes by intercutting desperately joyous circus performance shots from inside the tent with life-and-death gunfights erupting on the dusty town streets. The results are brilliantly jarring. Otherwise, Boot Hill has relatively little to offer in terms of drama and compelling plot. The entire miners-under-threat narrative is hurriedly dropped into the film and bungled in terms of building any tension, resulting in a climax that fails to captivate. Terence Hill provides a reminder that he was quite effective, if less popular, as a serious and dangerous western persona. 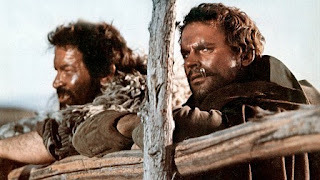 Bud Spencer makes a late appearance and leaves hardly any impact, while Woody Strode shines in a relatively rare opportunity as an almost leading man. 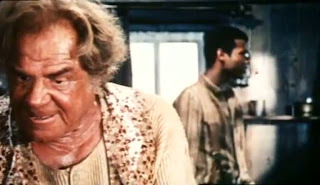 Strode's dominating physical presence was generally underutilized in the movies, and Boot Hill benefits from unleashing him to cause some serious damage. Boot Hill climbs about halfway up the hill, enjoys a reasonable view, but is held back by some clumsy boots. This film leaves me with a couple of questions. Is Thomas the same Thomas from 'Ace High'? If so, why is he being played by Woody Strode and not Brock Peters? When and how did Cat and Hutch split up? What happened to Cacopoulos from 'Ace High'? Did they mention anything?